Rebecca Estrada, executive director of El Hogar del Nino, speaks against child care funding cuts at a press conference Thursday. A budget passed by the Illinois Senate would cut child care subsidies by $1.6 million compared to last fiscal year – smaller than the $6 million cut that was previously proposed – but advocates are still fighting for more funding. 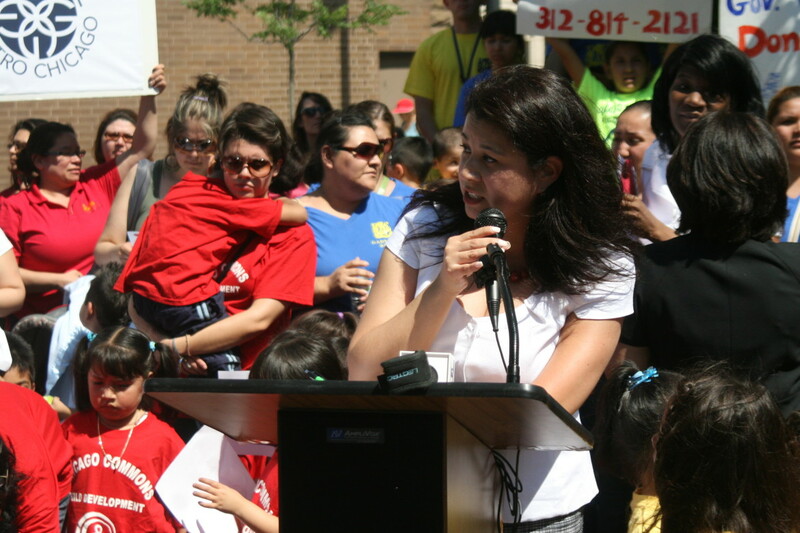 On Thursday, parents, children, and members of the group Pilsen Neighbors held a press conference at Pilsen’s Plaza Tenochtitlan to demand a neighborhood meeting with Illinois Governor Pat Quinn about the cuts. Because of available child care, Ojeda says she is on track to finish her associate’s degree at the end of the summer. After that, she hopes to study bilingual education – maybe at National-Louis University – and become a CPS teacher. Even more cuts are on the table in the House budget bill, introduced today, which would cut the Early Childhood Block Grant by $25 million. *Maintain funding for home visiting programs. *Reduce Early Intervention funding by $1.4 million.